Biore pore unclogging scrub is an exfoliating scrub cleanser made by Kao brands, Inc. It is oil-free and contains fine granules or beads to gently scrub the dirt and excess oils from the skin. The product has a pasty, thick consistency. Not much of this product is required, just a squirt about the size of a coin in the palm of your hand to clean the skin. It is a pale green color and the first thing that comes to mind when I use it is "cucumbers." 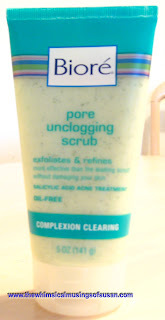 Biore pore unclogging scrub is cool and refreshing. You can feel the menthol tingling, when you lather it up and put it on your face. It has a very light and fresh scent, which lingers until you put something else on your face. Biore pore unclogging scrub comes in a compact, flexible, plastic container. It is available in a 5 oz. size. There is an easy flip cap on it, which fastens securely. The container is small enough to carry with you on the go, in a purse or duffle bag. The container is transparent as well, so that you can get a glimpse of what the scrub formulation looks like before you buy it. The product is fairly cheap, at about $7.00 - $8.00 per bottle from most retailers. Once in a while, coupons are available for this product at the company website or in the Sunday paper inserts. I started using this product about 3 years ago, after a bout with moderate adult acne. I didn’t have money to run to a dermatologist for a prescription drug. So, I hit the retail stores for an over-the-counter product to help me. I experimented with many over-the- counter acne products. Finding the right product for me was largely trial and error. Then, Eureka! I found Biore pore unclogging scrub. Although, the product can’t be expected to cure acne, it was very effective at clearing up and preventing my acne breakouts. I am in my thirties, and don’t have a severe acne problem. I didn’t use Biore pore unclogging scrub in conjunction with any other acne treatments, either. After using it a few days I saw a noticeable difference it acne breakouts. That’s how I found this product and I still use it. Biore pore unclogging scrub contains 2% salicylic acid, which is the active ingredient to help fight acne. I like that, although it contains salicylic acid, it is not harsh on my skin. I am used to other salicylic acid containing products causing my skin to be sensitive to sunlight. With other products, my skin becomes darker around my mouth and leaves the skin cracked, with some dry patches. Also, other similar products tend to leave my skin irritated and might burn during use. There is nothing more embarrassing than having dry, cracked, skin along with acne pimples. I never have this problem with Biore pore unclogging scrub. The product is safe and gentle enough for everyday use. I use it 2-3 times per week, in the evenings, just before I am ready for bed. I caution that some users may have a reaction to using this product because it contains some ingredients which are known irritants to some people. I recommend that anyone that uses a product containing salicylic acid, also use a good sunscreen (which people should be using regardless). However, I would still recommend Biore pore unclogging scrub for anyone who had mild acne or occasional acne breakouts. This product might not help people with moderate to heavy acne breakouts. In this case, I suggest visiting a dermatologist for treatment. If you want more information about Biore pore unclogging scrub, you can call 1-888-BIORE-11 or visit the company's website at www.biore.com.